Mogul is a game by Michael Schacht (Zooloretto) which was released in 2002 but has had some additions for the new release too. 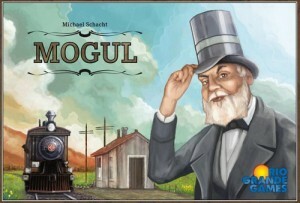 It’s a eurogame with a train theme and uses the excellent central game mechanic found in No Thanks. The game board shows several interlinked (coloured) railway lines with locations for depots along them and players start with some shares in some of the lines and some chips. Share cards show the colour of the line they are shares in, plus they also show a different line’s colour in a box too (I’ll call this their ‘second colour’). Each round, a stock card is revealed to be auctioned. First, all players earn $1 for each share card they have that matches the revealed share card. Then, players take turns to either place one of their chips in the centre (so they remain in the auction), or pass (which means they’re out of the auction but take all the chips placed so far).